Halloween holiday is coming now. I love this Halloween holiday since I was a small child for the special decorations, costumes, trick-or-treating, parties and all the joys of this wonderful, fall holiday. Do you have the same feeling when you were young? This year we work with MacXDVD and prepared the best Halloween gift for you. 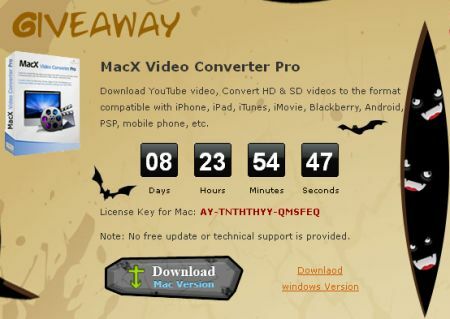 MacXDVD Software launched Halloween 2011 giveaway offer on Oct 27, through Nov 6. During this period, you could download licensed MacX Video Converter Pro for free. It allows you to download YouTube videos and convert both SD and HD videos on either your Windows or Mac so that the converted videos can be played in an iPhone, iPad, iTunes, Blackberry, Android, PSP, and any other smartphones. This giveaway offer does not require you to do anything else but copy the license code and enter it after downloaded the demo. There is no functional limitations or watermark. However, it does not enjoy free upgrade service and restricts you to use the key to register before the end of the offer. Once you have well activated the program, you could use it as long as you like unless you try to upgrade or reinstall the system. Meanwhile, they also offer coupon code on MacX DVD Ripper Pro. It is the first time I saw they give such a big discount on it. It only costs you $29.95 now while regular price is $49.95. That’s cool. Seize the chance to get your Halloween free gift right now.